When we started this project, I genuinely thought it would take a couple months to knock out. I didn’t imagine it would become the six-world, eight-boss, five-hours-to-speedrun monstrosity that it is today. I didn’t imagine it would spawn a full-on game company. I didn’t imagine that we’d get a ton of amazing fans who, for some weird reason, seem to actually care about this thing. But here we are, and I couldn’t be happier. This is the start of something incredibly special. Thank you for your patience, and thank you for being a fan. Let’s do this. 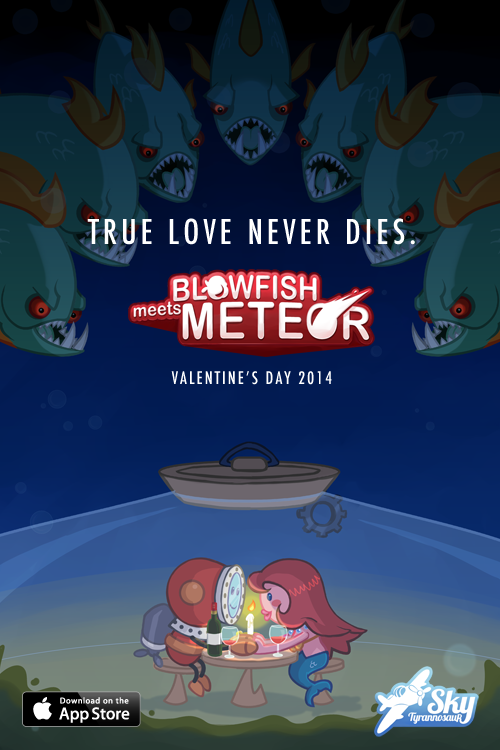 Blowfish Meets Meteor launches Valentine’s Day 2014. This entry was posted in Uncategorized by muirfreeland. Bookmark the permalink.